Greg Prudhomme knows what you’re thinking: Is it really necessary to reach all the way to Europe for tennis players for a university located in Phoenix? In such a global sport, the answer is yes. 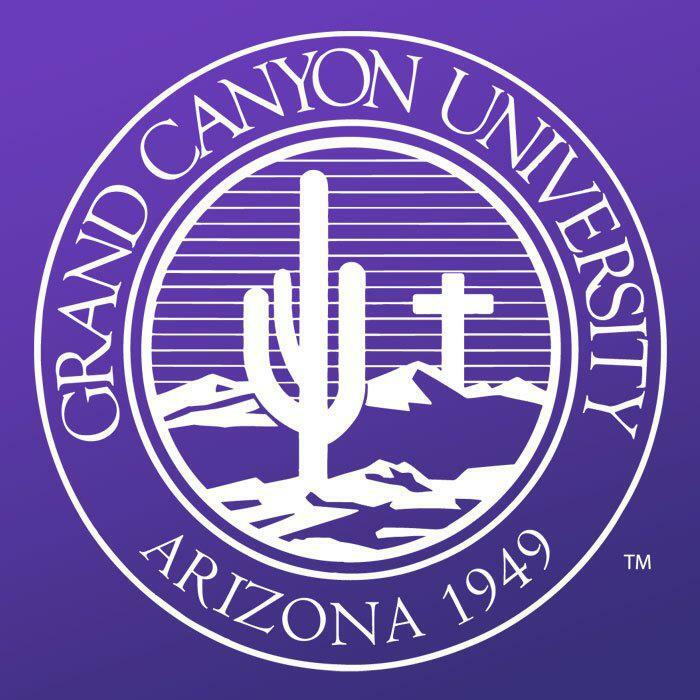 Eight of 12 players on the Grand Canyon University men’s team are from overseas, and so are five of nine players on the GCU women’s team. Both teams are coached by Prudhomme (pictured above), a Phoenix native who is in his sixth year at the school and quietly has built the Antelopes into an NCAA Division II power. It’s not that Grand Canyon is lacking local talent. Two of its top singles players – Ahmad Saleem (Phoenix) for the men and Priscilla Annoual (Peoria) for the women – are homegrown (not to mention other players like Taylor Young, Jordan Bridges, Kaila Knopf, Arjun Bal and Jacob Spizman are Phoenix-area products). It’s just that college tennis isn’t like basketball and baseball, which benefit from an abundant supply of American high school athletes. The talent pool is very different for sports such as soccer and tennis. "Those are the two biggest sports worldwide," says Prudhomme, 42, a former Arizona state champion for Greenway High School who attended Arizona State University and graduated from the University of Arizona. "At the top of those two sports are athletes from all over the world. The number of international players at the Division I and II levels is high." Prudhomme works an array of European connections to recruit those players to Grand Canyon. He speaks fluent German and plays each summer on a semi-pro team in Lorsch, a town near Frankfurt where an aunt lives. He is plugged into German tennis clubs and French tennis academies, knowing coaches at those places. And he’s online almost as much as he’s on the court. "Athletes (in Europe) surf and look at websites and send tons of emails," Prudhomme says. "They sometimes don’t know the difference between New York City and Tucson." Now that Grand Canyon’s teams are ranked in the top 20, he says, it’s much easier to promote the tennis program to players who might not have heard of it – and that includes those in the Southwest. "There are many players in the Southwest who didn’t know about us or wouldn’t consider playing for us when we were getting started," Prudhomme says. "I’m grateful for the strong local players, like Ahmad and Priscilla, who did join us and helped push the program forward. "I don’t blame the locals who weren’t interested in playing for us in the past. 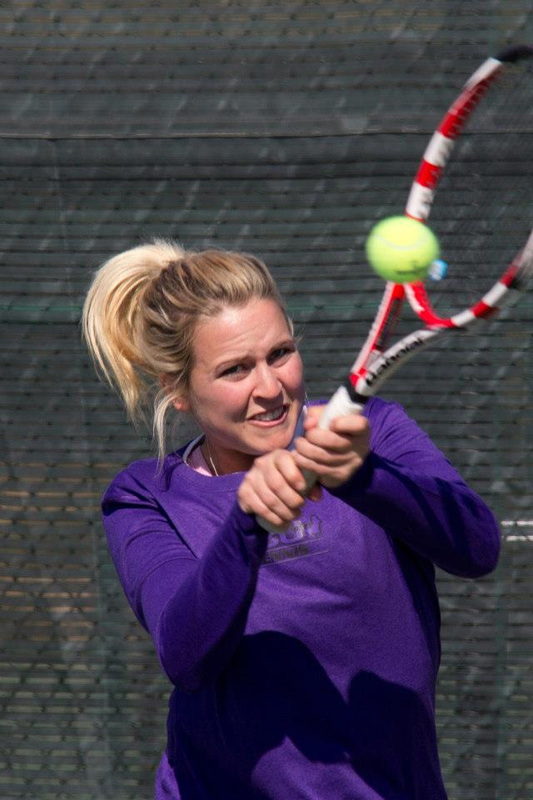 But GCU’s growth has made it one of the best universities in the country for many reasons, and the level of our tennis programs – along with our national rankings and Division I status – make us a great choice for anybody." It wasn’t so long ago that Prudhomme, who has a degree in business, had a much tougher sell to make. The women’s team at Grand Canyon was 1-14 before he took it over, and his first men’s team didn’t win at all. Those were lean beginnings, but he kept the faith and his enthusiasm never faltered. "I preach every day that success is judged by many criteria in addition to wins and losses," he says. "If you don’t judge success by alternative criteria, you’re in big trouble. I preached on the excitement of being the first men’s team at Grand Canyon in over 20 years. And this year, we’ll be the last Division II teams in Grand Canyon history." Last November, Grand Canyon accepted an invitation to join the Western Athletic Conference and move up to Division I. The conference will have at least eight other members for 2013-14: Seattle, Idaho, Utah Valley, New Mexico State, Cal State Bakersfield, Texas-Pan American, Missouri-Kansas City and Chicago State. 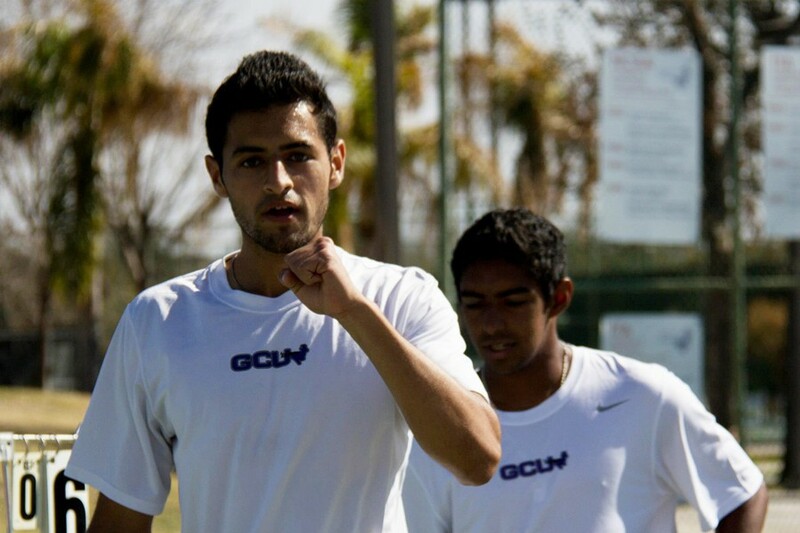 Saleem (pictured, right), a junior who was an Arizona singles champion for Desert Vista High School, says he considered the University of Arizona and Marquette before deciding on Grand Canyon. "I felt this was the best place for me to balance academics and athletics," says Saleem, a pre-med major who took private tennis lessons years ago from Prudhomme. "Greg is a great mentor in addition to being to being a great coach. He’s a positive person and never negative, no matter what. "It’s all about attitude and effort. If you leave everything on the court, you have nothing to feel bad about. We fight for every point." Prudhomme’s tennis resumé is impressive. He achieved a world ranking on the ATP tour in singles and doubles, an amateur ranking of No. 5 in the United States and the No. 1 ranking in the Southwest in three different Open divisions. 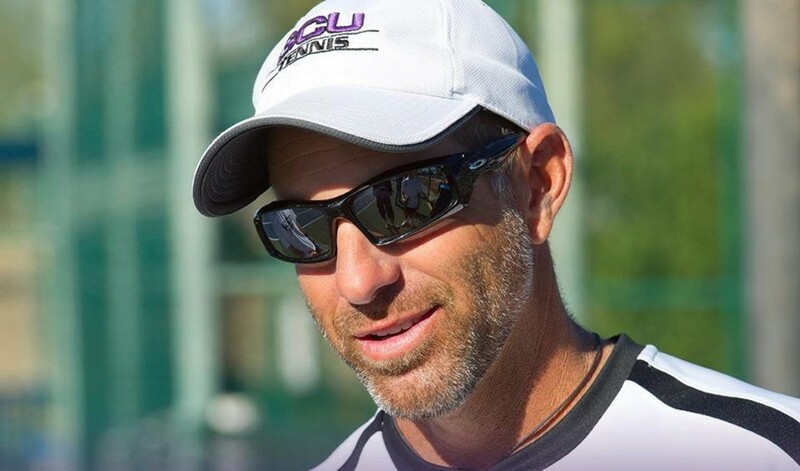 In only his third season at Grand Canyon, he was named the Division II Men’s Coach of the Year by the Intercollegiate Tennis Association, and he also has been the West Region Coach of the Year (for men and women) and the Pacific West Conference Coach of the Year (for women). He says Grand Canyon already has been a springboard to tennis careers for some of his players. Freddie Schoelzel is a coach for Tamira Paszek of Austria, one of the top women’s players in the world, and Patrice Giraldi works for a tennis academy in southern California. "There’s not a kid in the last five or six years who hasn’t said everything (at Grand Canyon) is better than I said it would be," Prudhomme says. The blend of international and regional athletes has been a plus, he says. "That’s part of the learning experience, trying to create an environment that embraces the mixing of cultures," he says. "What better way to prepare them for the real world? Every summer, I’ve had players go overseas and visit teammates. "I understand the concern of American tennis parents and purists (over the numbers of international players). But I benefited from it as a player, and I think the benefits outweigh the concerns. … We’re open to any player who is at the level we need in order to be one of the best Division I teams in the country. I’d love nothing more than to have a strong local and regional presence." • Men’s team: U.S. (4 players), Spain, Sweden, Portugal, France, Germany, Finland, Austria, Switzerland. • Women’s team: U.S. (4), France (2), Germany (2), the Netherlands.